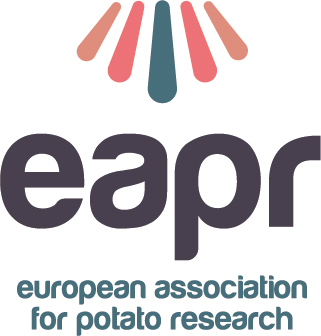 Sub-tropicalisation of potato has increased the threat of dry rot during postharvest potato storage at elevated temperatures (10–12 °C). Potatoes meant for processing are generally stored at 10–12 °C, where not only sugars accumulate during prolonged storage, also Fusarium species affects the tuber quality and leads to more losses. Therefore, the present study aimed to reduce the physiological and pathological losses by retaining the processing quality of potatoes through coating with three concentrations of chitosan (0.1%, 0.25% and 0.5%). Tubers were stored at 12 ± 1 °C with 90–95% relative humidity up to 170 days and analysed periodically. Sugar accumulation reduced with chitosan coating of tubers. Chip colour was retained in all coated as well as uncoated tubers. Coating at 0.25% chitosan showed improved chip colour compared to others. Concentration of flavouring compounds increased with increasing chitosan concentration. Chitosan coating reduced the rate of respiration and weight loss. Maximum decrease in rate of respiration with coating was 22% in cultivar Kufri Jyoti and 25% in cultivar Kufri Frysona. Weight loss decrease was 26% in Kufri Jyoti and 15% in Kufri Frysona compared to uncoated tubers. 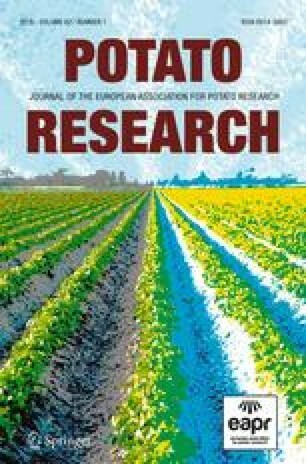 Chitosan coating reduced the Fusarium incidence significantly in dose-dependent manner. Chitosan at 0.25% concentration was able to completely inhibit Fusarium growth. Coating of whole potatoes with chitosan increased the storage life of tubers by reducing the pathological and physiological losses. Coating of tubers with chitosan prior to cold storage will help potato processors to reduce postharvest losses.